About a month ago I began the project of reading through the books that were winners of the Hugo award, the Nebula award, or both. While it doesn't always guarantee a wonderful read, I consider it important to know what books have made a big impact in the worlds of sci-fi and fantasy. I was a bit surprised at the number of titles and authors that I was unfamiliar with, so I set out to educate myself. 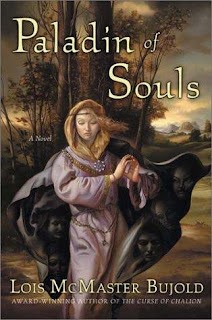 That search has led me to Paladin of Souls, the 2004 winner of both the Hugo and Nebula awards. Pleased not only because two medals are better than one (hmm? ), but also because by reading something from both lists I can trick myself into feeling like I'm making twice the headway in my project, I requested it from a local library system. Even though it is a sequel to "The Curse of Chalion" (a medal nominee in a previous year), I decided to push ahead and read it anyway, both because of a long list of things to read, and the trust that an award-winning author should be able to provide any pertinent backstory without boring me to tears or confusing me. It turns out that other readers complained that this "sequel" is a bit far removed from book 1 anyway, so in that way it was nice not to have preconceived notions to dispel. The primary character of Paladin of Souls is Ista, a middle-aged woman of high nobility, who at one point has dealt with gods, the death of her son, and a few years of madness. Now pampered and constantly supervised by those close to her, she has grown restless with her life. Ista determines to get away for a while, and comes up with the idea of taking a pilgrimage to various holy sites dotting the land. She assembles an interesting group of characters to travel with her, and adventures begin. With five gods, demons loose in the land, sorcerors, and enemy kingdoms all stirring towards war, she finds herself in the heart of a perilous situation being used as an instrument of the gods as she was once before. I found the story to be very engaging. The writing didn't throw excessive detail in my way. The plot was interesting, the solutions for problems were not obvious but they were realistic (to that world's laws, anyway), and I found the dialogue humorous and full of real humanity. I especially enjoyed Ista, who bitterly cursed the gods but couldn't refuse them because of what was at stake. Mixed in with a host of interesting characters that undergo great development throughout the story, and a little mystery that slowly, teasingly comes together into a believable yet unusual story within the larger one, I was well pleased from the beginning pretty much through the end. It is no surprise to see Bujold's name sprinkled throughout the list of books I plan to read as the recipient of so many awards. Lots of archetypical thematic elements going on there. I'm not normally a fantasy person outside Harry Potter, but this sounds sort of interesting.